You might think a 90 million year old fossil bird with teeth would make even the most die-hard creationist stop and think but if so, you haven't met many die-hard creationists. Dismissing evidence of just this, such as that presented by a team of geologists from the University of Rochester, is the work of but a moment for any half-decent creationists who have been rehearsing the traditional arguments for years. "It's a forgery; they got the dates wrong; it's still a bird; it died in 'The Flood'; anyway, it doesn't count as evidence because The Bible sez... and you weren't there to see it, etc., etc., etc." But to normal people who don't need to perform intellectual gymnastics of the most excruciating kind to avoid the truth, this is yet more evidence not only for the early evolution of birds but of profound climate change in the late Cretaceous. This and other fossils of this species were found high in the Canadian Arctic but the species resembled something between a gull and a diving cormorant, so would have needed open water for twelve months of the year, hence the climate to support this ecosystem must have been warm even in winter. Bird fossils from Turonian (ca. 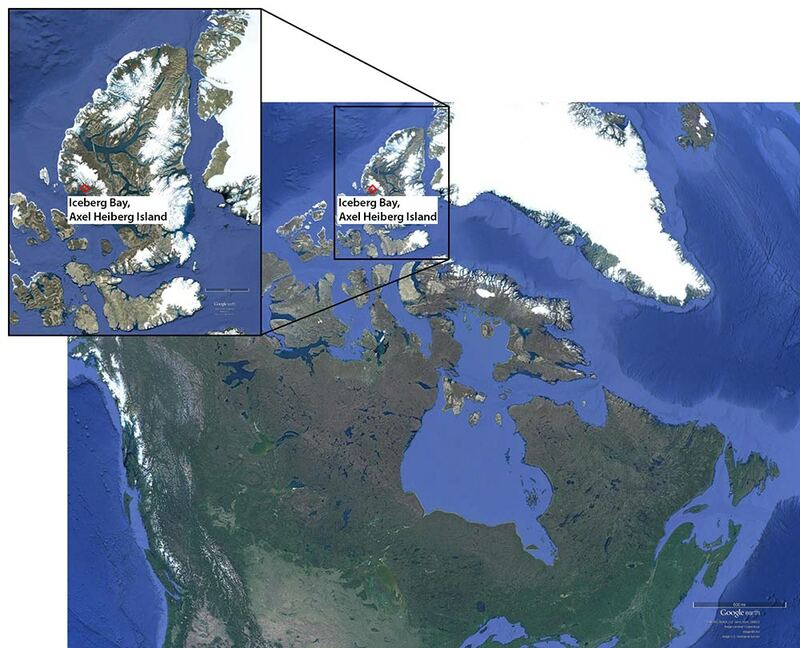 90 Ma) sediments of Axel Heiberg Island (High Canadian Arctic) are among the earliest North American records. The morphology of a large well-preserved humerus supports identification of a new volant, possibly diving, ornithurine species (Tingmiatornis arctica). 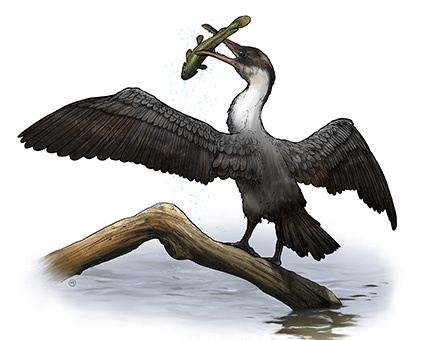 The new bird fossils are part of a freshwater vertebrate fossil assemblage that documents a period of extreme climatic warmth without seasonal ice, with minimum mean annual temperatures of 14 °C. The extreme warmth allowed species expansion and establishment of an ecosystem more easily able to support large birds, especially in fresh water bodies such as those present in the Turonian High Arctic. Review of the high latitude distribution of Northern Hemisphere Mesozoic birds shows only ornithurine birds are known to have occupied these regions. We propose physiological differences in ornithurines such as growth rate may explain their latitudinal distribution especially as temperatures decline later in the Cretaceous. Distribution and physiology merit consideration as factors in their preferential survival of parts of one ornithurine lineage, Aves, through the K/Pg boundary. Map showing the area in the Canadian arctic where the fossil was found. The fossilised bones of Tingmiatornis arctica were fond in sedimentary rocks overlying volcanic basalt. Scientists believe a period of high volcanic activity pumped masses of the greenhouse gas carbon dioxide into the atmosphere, leading to global warming sufficient to allow a sub-tropical climate this far north. Now, it should be possible for any half-decent creationist to dismiss the evidence of diving birds with teeth in the Arctic, of 90 million year-old fossils, even of nothing resembling this species being found amongst the fossils of recent animals such as we would have expected had they died out a mere 4000 years ago, but there is one little problem and a problem of their own making. 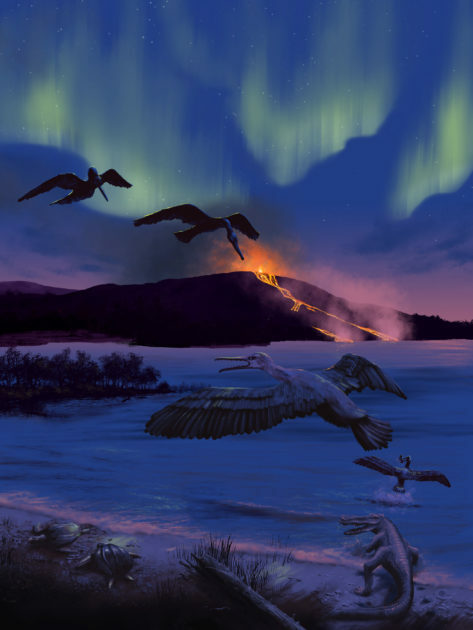 An artist’s conception of the bird’s possible environment 90 million years ago, characterized by volcanic activity, a freshwater bay, turtles, fish, and champsosaurs. Image credit: University of Rochester illustration / Michael Osadciw. If this species had died out because of 'The Flood', and had this fossil been found in sedimentary deposits resulting from 'The Flood', the climate when 'The Flood' occurred would have been such that there were none of the species now normally associated with the Arctic and Antarctic. Yet species adapted for living in this climate would have been living at the time of 'The Flood' in order to survive until modern times. No matter how impossible the idea is, creationism can't escape the 'fact' that, were 'The Flood' myth true, polar bears, penguins, and other species adapted to polar regions would have been alive 4000 years ago, so this bird species would not have been. But, had this species survived 'The Flood' and become extinct later, the period of global warming to produce a sub-tropical climate in the Canadian Arctic must have occurred after 'The Flood' - so exterminating polar bears, penguins, etc. And we know this didn't happen. We also know there is no recent record of the extreme temperatures this would have produced in, for example, the part of the world where the Bible stories are set. In other words, Tingmiatornis arctica must have become extinct before 'The Flood'.